Time to head out on the highway! A follow-up to the fan favorite CAO Flathead Series, the master creators at CAO have introduced the CAO Flathead Steel Horse collection as an inspiration to American’s passion for the motorcycle. These hand-rolled premium cigars are medium-to-full bodied consisting of Brazilian Arapiraca binders with Honduran, Nicaraguan, and Dominican long-fillers wrapped up perfectly inside an aged Connecticut Habano Grueso tobacco leaf. 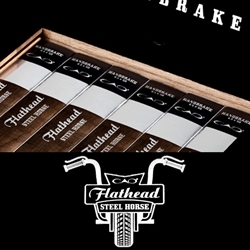 CAO Flathead Steel Horse premium cigars are similar in design to the Flathead series, maintaining the signature squared-off head but infused with a different blend of tobacco that produces elegant notes of leather and spice. The results provide an Easy Rider smoking experience making these handmade cigars a perfect complement to the Flathead franchise. The CAO Flathead Steel Horse is a high-quality cigar line offered at an everyday smoker's price, affordable and available to cigar connoisseurs everywhere! Try the one of the varieties of sizes and flavors listed below at our online cigar store. Each of these styles are in stock today at a low discount price! Call us for more details!